As I work at improving my guitar skills, I pass on info to you through the "Learn To Play Rock Guitar Newsletter". I'm constantly seeking out good guitar info and tools to help speed up the process of becoming an Axe Master. Because you're a fellow guitar lover and afficionad, I like you and want to share the good stuff I find out there on the world wide net. That's why I created this website - and that's the reason for the newsletter! Subscribe to the newsletter, and I'll hook you up with FREE printable chord charts, including Drop D Tuning (my most popular 'alternate tuning' request!). 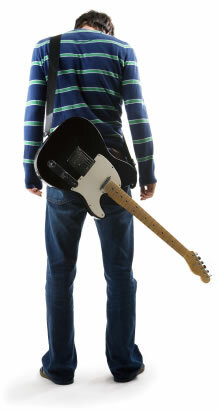 Then, periodically I'll send you new beginner rock guitar lessons and info to help you reach your "rock star" goals. I'll keep you up-to-date on what's happening around the site, new lessons and links to solid guitar instruction.